You may have read this blog ‘Is Australia Moving in a Healthy Direction?’, that I wrote last year when natural therapies & private healthcare were making news in Australia, & seen some conversations & petitions on social media…but it’s all gone really quiet now. Ever wonder what happened? So that means we’ll keep paying the same amount for our ‘extras’ policies, but this list of therapies will no longer be covered / you can’t claim for these services anymore & will have to pay the full cost of each treatment. Or – potentially, (depending on what the health funds decide to do), you can look for a fund that will still offer cover on these extras, but you’ll have to pay around 30% more for your policy (there will be no government rebate for these private health policies). There will likely be some big changes & a lot of people switching health funds around this time, depending on what the individual funds choose to do in response to the government policy change. Either way – it boils down to some really useful preventative therapies becoming more expensive to proactive health-conscious consumers, so that more $$ can be directed into the pharmaceutical industry & ‘end stage’ treatment of illnesses. Unfortunately, many of the most costly illnesses to our healthcare system (i.e. type 2 diabetes, cardiovascular disease) are also the most preventable, given early support from some therapies on the ‘no-longer-covered-list’ (i.e. if you consult with a naturopath semi-regularly throughout your 20’s / 30’s / 40’s (sometimes even just once would be enough), the chances of you ending up with diabetes & heart disease are SOOOO much lower, as they’ll help to direct & support you with healthy diet / lifestyle choices, & supplements where appropriate to maximise your health & vitality, rather than just treat illnesses as they come up). Let’s encourage Australians to take even less responsibility for their health! We’ll offer no financial support for those wanting to be proactive, we’ll just channel all the funds into treatment of end stages of illness – when health is severely compromised already…often by diseases that could easily have been prevented, given the knowledge & support. Sad face. Angry face. Eye-rolling face. Good thinking guys. Don’t get me wrong – I’m very aware & grateful for the amazing access to affordable medical care that we enjoy here in Australia, I just believe we should also encourage the use of natural therapies as well. Massage Less Accessible, Psychiatric Treatment More Accessible. Love to hear your thoughts – will this change impact the way you manage your health? However you feel about it, it would be a great idea to book everyone in for a massage / treatment / consult & make the most of your wellbeing cover while it’s still valid! 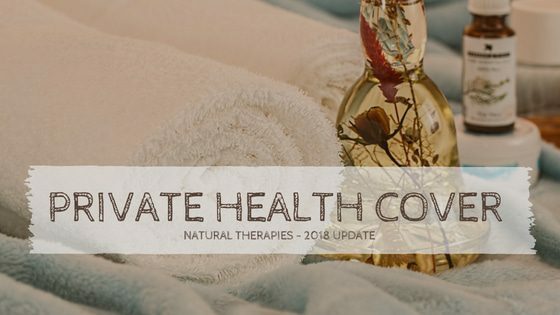 This entry was posted in General Health and tagged 2019 Private Health Changes, government rebates, Natural Therapies, Private Health Cover.